The Combat Veterans Motorcycle Association is a group of Combat Veterans from all branches of the United States Armed Forces who ride motorcycles as a hobby. Their mission now is to support and defend those who have defended our country and our freedoms. Their focus is to help veteran care facilities provide a warm meal, clothing, shelter, and guidance, or simply to say “Thank You” and “Welcome Home”. 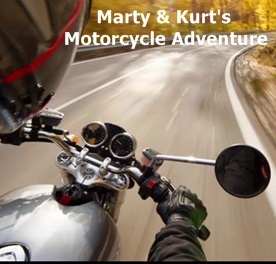 This medley admittedly doesn’t have anything to do with veterans per se but it is dedicated to two gentlemen – and they certainly are that – who are both veterans and very involved with the CVMA … Marty Morse and Kurt Merriman. They love the support work they do and they most definitely love their bikes! What can I say but I have a big grin on my face Ray! I have to admit I had not heard the Saailcat song for an eternity! I may have geuessed Bon Jovi and Steppenwolf but not some of the others. Thanks you for another great start to my day! Marty, I’m glad you enjoyed it. Both Kurt and you deserve the attention for what you do but after writing what your organization is all about, I tried to keep the music light. Nancy, hope you are kidding but fear you are serious. It is not a good experience I can attest to that fact. Had two good friends the had a similar sounding accident at 55mph. Both fully recovered but involved several months of rehabilitation to recover physically. Both of these individuals are still avid riders and cover many miles participating in events around the country. I ride recreationally these days so if it is 50 miles or several hundred it always enjoyed. Envy your “winter” weather! No I’m not kidding. We were riding with another couple and it was a very hot day. I passed out and fell in the road in front of them and they ran over me. It took me two years to recover…I had to go to speech therapy and learn to talk all over and still have trouble with my speech and PTSD in heavy traffic of any kind. I did actually get back on but because I couldn’t ride with other bikes around me we sold the bike. All things happen for a reason. While they were trying to find all that was broke they found a small spot on my right kidney and it turned out to be cancerous. They removed 1/2 of the right kidney and got all the cancer, so that accident really saved my life. Damn, Nancy, I didn’t know any of this!